This blog was co-created by ELGL members Lawrence Grodeska and judi lynn brown with input from the rest of the CivicMakers team, and is cross-posted from the CivicMakers site. The govtech movement holds great promise, but is hindered by a glaring blindspot — the assumption that technology alone will solve our public problems, without considering either the people or processes that tech is meant to serve. 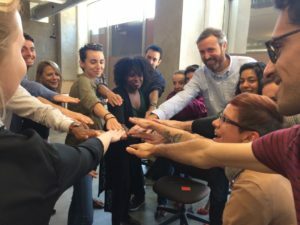 Based on the learnings of the CivicMakers team and our culture change work with local governments, this post sets out to explore how organizational culture can be cultivated to help local government orgs thrive as the resilient and responsive entities they need to be for our collective wellbeing as a society. We live in trying times. The federal government shutdown does not appear to have an end in sight. California is drying out and burning up. Wealth disparity is at obscene, unacceptable levels. The housing crisis rages on. Basic infrastructure is crumbling. It is all too easy to be cynical, but there is a source of great hope, a raw resource of tremendous reach and incredible leverage that touches every aspect of our lives. Believe it or not, we’re talking about government, and the public servants who comprise it. Of course, faith in our government institutions is at record lows, yet our social and environmental problems are so complex and seemingly intractable that these institutions must be leveraged to create change at scale. The crises we face will not easily abate without sustained, collective efforts to address them, yet bearing the weight of these issues day in and day out comes with the real risk of individual burnout and structural breakdown. We need to cultivate the personal and organizational resiliency to continually adapt, to get up again and again in the face of challenge or failure. How do we build this multi-tiered resiliency? Put simply, we do it through culture. A culture of shared values and vision. A culture of strategic foresight and thoughtful design for the best possible future. A culture of good management and embracing change as the only constant. A culture of recognizing the best in ourselves and in others through clear, open communication. As both the govtech and civic tech movements have grown over the past decade, most of the focus has been on technology, and there has been great work done on this front. Canada’s new “Directive on Management of Information Technology” embraces open source and open source standards. Here, in California, Governor Gavin Newsom has put forth a string of exciting initiatives that outline new procurement pathways for technology solutions, propose a California Office of Digital Innovation, and assign a DMV Reinvention Strike Team. However, even with these worthy efforts, we have a long way to go towards realizing the positive, transformative potential of technology in our government institutions. We believe the gap between the promise of govtech and meaningful, measurable impact lies in a collective blindspot that assumes technology is the ultimate solution, rather than an enabler of people, organizations, and the services and solutions they offer. Though digital government services and other modernization efforts embrace people-first methodologies like human-centered design, too often the people using these tools and the culture that supports them are not a focus of innovation and digital transformation programs. Without engaging those closest to the work on the frontlines of public service, we are missing the opportunity for true transformation and long-term change. What follows is our vision for a holistic approach to cultivating a more resilient and responsive culture in local government, along with a few concrete examples. Borrowing from the idea of a “technology stack,” which comprises all of the tools and frameworks used to build a software application, we propose a “culture stack” that comprises the various “layers” necessary to truly change the culture of an organization for the better. The old management adage is more true than we might want to accept; we are only as strong as our weakest link. Designing software or services is easy, getting people to adopt them is hard. But a finely tuned organization of engaged contributors all practicing their unique brand of leadership offers too much untapped potential for us to take the easy route. 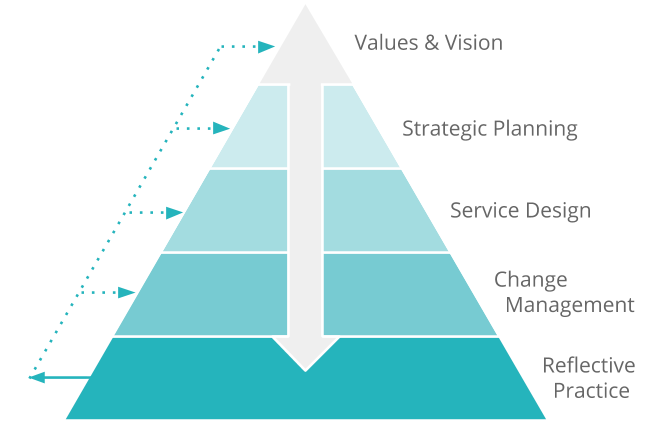 This is the traditional top of the pyramid according to organizational design. Why does an organization exist? And what values have led to its vision? Too often the “top of the pyramid” reflects only a top down perspective. These elements, in particular, must be co-created by individuals at all levels of an organization for there to be buy-in, accountability and incentives to carry out a collective vision. As the philosophical debates about the role of government continue, co-creating clear organizational, agency-wide, or even departmental visions helps us see more clearly where we’re headed. The values that emerge from the vision provide a roadmap for how we live that vision, and form the basis for daily decision making. We bring the promise of democracy to life when considering everyone and every voice possible in this co-creation. Example: Vision Zero is a framework for traffic safety programs that lays out the vision of “a highway system with no fatalities or serious injuries involving road traffic” based on a core principle of “Life and health can never be exchanged for other benefits within the society.” This principle has made major impacts by saving lives across the globe. With the north star of vision and values as our roadmap, planning can begin. This is where we operationalize our values and vision. Again, this should not include only those at the top. Planning efforts must engage every corner of an organization and the staff who are responsible for delivering on strategic objectives that make up a plan. Too often, strategic plans are developed out of assumed necessity, the process itself relegated to “this is just what we’ve always done.” In our work, we’ve found the process is just as important as the product; that planning itself can be as dynamic as we humans are, and that a plan can do more than sit on a shelf. A well-defined, well-executed plan aligned with vision and values can bring change to life. It is time to modernize and reimagine this process as a prime example of where technology can be a helpful but not integral component. Example: The City of Santa Rosa’s Community Advisory Board had a vague mandate in the City Charter that led to a lot of passionate community members spinning their wheels over how to apply their talents. Through multi-faceted stakeholder engagement and co-creation workshops, our team at CivicMakers helped them create a strategic roadmap to get everyone on the same page. Service design is quickly becoming the go-to methodology for creating successful products and services in local government. This layer is usually the focus of the govtech field’s emphasis on digital transformation, both in building or procuring better software. This work can often operate independent of organizational vision and strategic objectives or without the complete buy-in from stakeholders across an organization. Improving public services can be greatly improved with a human-centered design approach, where multiple stakeholders and user groups are engaged in articulating the features of the final product. But it is critical that this layer integrates with planning above and change management below. Example: The Service Design Studio at the New York City Mayor’s Office for Economic Opportunity is a shining example of what’s possible when public servants embrace human-centered design in their day-to-day work. Once a new tool, process or even org design is ready to roll out, the change brought about needs to be managed. The field of change management is ripe for its own modernization efforts, since many components of this discipline existed before the digital age. Managing change in this context involves careful consideration given to the cultural, or human side, of organizational change. Change management, or leading through and embracing change, necessitates a human-centered approach. Likewise, service design should flow smoothly into change management; those involved in service design should also be involved in aligning the human systems and processes that dictate the need for change. Example: While literature on human-centered change management is lacking, we’ve used the methodology underlying this infographic as a starting place for integrating an iterative, adaptive and contextual process for managing change. We at CivicMakers are currently doing this work with the City of Berkeley and will be writing more about our learnings soon. At the bottom of this stack is “reflective practice,” which wraps right back around to Vision & Values at the top of the stack. Reflective practice provides an opportunity for an individual and organization to continuously learn and improve by providing a framework for individual and organizational assessment. The practice is most often used in professions such as healthcare, but we have found it useful for not only learning from our individual or organizational “failures,” but as a way to surface the unique institutional knowledge we all carry as practitioners. Without taking time to intentionally assess ourselves and our work, we will never know if we have improved. Without accountability, we will never be motivated to improve.As public sector practitioners, it is rare for us to really think about how we apply our own approaches to learning and problem-solving to our practice. In the trainings and workshops we facilitate, we encourage both individuals and organizations to take time to learn from each other and examine our own relationship to our work. This can come in the form of quiet, individual reflection time at the end of the week that is set aside for the purpose, through a regular practice of holding post-mortems after projects, or through metrics-driven performance evaluation frameworks for entire organizations. By surfacing knowledge and practice, we can design assessments that are more relevant, meaningful and more likely to hold ourselves accountable to continuous improvement. Example: The Innovation Office within San Francisco government’s Human Services Agency uses Results-Based Accountability and project pre- and post-mortems as a means toward continuous improvement. Of course, culture change is a long road that requires passion and persistence, along with the hubris to dream big and the humility to accept our failures along the way. But changing culture is not impossible. Rather, it is eminently achievable, and only by the very people who create culture in the first place–those that live and breathe it every day. We may live in trying times, but the potential for change has never been greater. In an interconnected, complex and dynamic world, there are no heroes; no singular President, CEO, Executive Director, City Manager or even organization is going to have the all the answers. Our best solutions come from collective wisdom and, in that spirit, we invite a dialogue — what have we missed?What are some of the best examples you’ve seen of creative, collaborative problem-solving and culture change? Let’s shine some light through the dark and share what’s working and what can be improved. Want to learn more about our work at CivicMakers? Aww, shucks 🙂 Thanks! The best way is to sign up for LINKS, our twice-monthly newsletter chock full of civic innovation and govtech goodness.